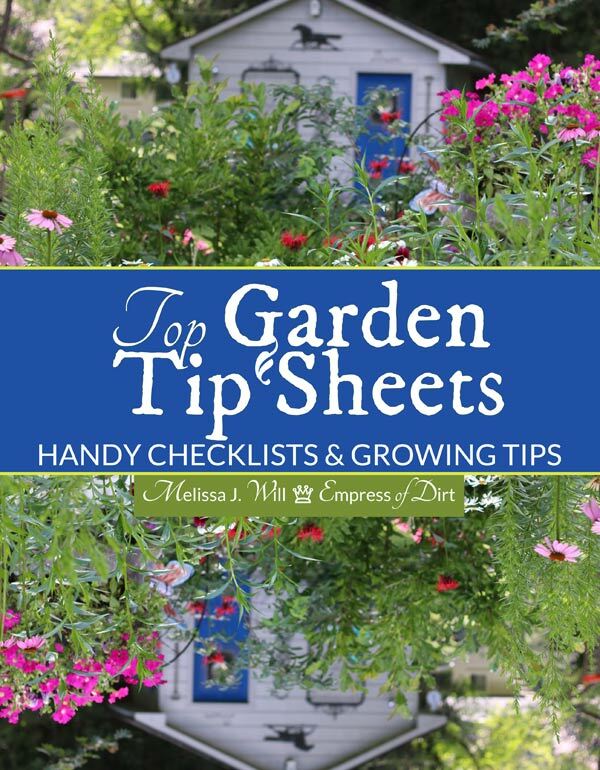 The most popular garden tip sheets, info graphics, and checklists on Empress of Dirt are now available in one convenient downloadable file. You can view the file on your computer or phone, or print it out to keep in your garden book. You do keep garden notes, right? Or, maybe you will start now. For creative projects, also see Empress of Dirt ebooks here. Count me in as one of the list makers of the world. When it comes to gardening, I like to do my research once, compile a useful list, and use it forevermore. If the topic is something I know Empress of Dirt readers will find useful, I post it here on the website. I often share the lists as ‘printables’, meaning a file you can download and print out or simply view on your device—or both. If you would like to have the best garden printables (so far), as many of you have requested, they are now available in one handy file. This new offering includes the twelve most popular garden tip sheets, info graphics, and checklists on Empress of Dirt, all in one handy file. These are the vegetables you can grow in cool spring and fall weather. This is an example of my own seed sowing plan for starting plants indoors in winter and spring in preparation for the outdoor garden season. If you are new to this, it will give you an idea of how to keep things simple and get everything started on time. A list of the optimum soil temperatures for sowing common veggies for best germination rates. It’s the best kept secret in gardening. Or, at least, one of them. Love tea or love a tea drinker? Have a look at these plants you can grow for homemade tea. Includes growing zones. Want continuous blooms throughout your garden seasons? Use this checklist to plan your garden. Not much sun? No problem! A popular graphic showing what you can grow with varying amounts of shade in your garden beds. Lists of plants you can grow from cuttings in spring, summer, and autumn. Get free plants from the ones you have. Confused by pruning? Learn these simple principles and you’ll know when to prune (and not prune) your garden plants. Step one: know what type of clematis you have. Step two: time your pruning right. Fall garden cleanup can be overwhelming. This handy tip sheet lists important tasks and timing, and those that can wait until spring. Fall and winter vegetable gardening is becoming popular in cold climates. This shows when to get your seeds and starter plants ready to ensure everything is ready when the cold weather sets in. Plenty of flowering annuals and perennials can be sown in fall, benefiting from the cold winter weather to come. Pretty graphics showing exactly when (by date) to start amaryllis, paperwhites, and other flowering bulbs indoors so they flower right when you want them to for holidays and other special occasions. The file is 36 pages, nothing fancy: just a convenient way to get the information—lists and creative graphics—and keep it handy. File can be printed out (the whole thing or individual items) or viewed on your computer, tablet, or phone. Each item is linked back to the original post on Empress of Dirt in case you need more information. What is an ebook or downloadable file? Downloadable files and ebooks are documents (files) you read on your computer, tablet, or mobile phone. The files and ebooks offered on this site are in PDF format. This means you use Adobe Reader to read it. Adobe Reader may already be on your device or you can download it free here. Once you have Adobe Reader, click on the Buy it Here button, pay by PayPal or credit card, and download the file. Creative + Frugal Garden Ideas: Getting Started with Empress of Dirt. Give it a try! Once you’ve downloaded your first one, a whole new world of reading opens up. PS: You can see more Empress of Dirt ebooks here in the book shop. Enjoy!